Not a month goes by nowadays without the announcement of some robot vehicle or another, and this is no exception. As the autonomous boat bandwagon gets underway, Yamaha is jumping on board with a self-piloting compact electric craft of its own, the BREEZE10. Now before we get anyone’s hopes up, this is a bit more utilitarian than the glossy, marble-and-glass affairs that we normally write about in these pages. The BREEZE10 is a scant three metres long and is designed for the perhaps unglamorous task of surveying lake beds. But the Company also has plans to evolve the autonomous platform to meet the specifications of surveillance and defence customers in the future. The BREEZE10 is designed with a dedicated mount point in the bottom of the hull that allows sonar equipment to be quickly swapped in or out depending on the requirements of the job at hand. It also features the ability to work in shallow locations thanks to the specially designed low-profile hull with integrated Yamaha marine electric motor. The defence applications seem to be pretty obvious, too. The world’s militaries are increasingly taking an interest in autonomous vehicles, and while drone unmanned aerial vehicles have become commonplace, we’re beginning to hear more and more about unmanned water-vehicle systems. A compact vessel with several hours’ running time and a hot-swap sonar would seem to be a good choice for a remotely-operated minesweeper, for example. Meanwhile, an inconspicuous, quiet marine drone might be of interest to various intelligence agencies around the world, although something would have to be done about the top speed if it were to pass muster with the James Bond types. As the robot revolution continues apace, we’re once again witnessing a new type of automated vessel take to the waves. 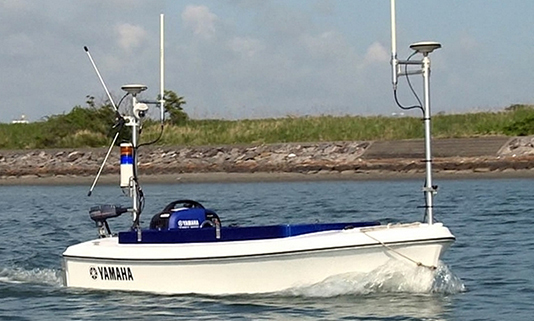 While it’s definitely a niche product, the BREEZE10 is sure to make waves in its market, and this is unlikely to be the last time Yamaha announces an autonomous marine vehicle.